Back in my day, if we wanted a legal high, we'd chug cough syrup or smoke salvia and that was good enough for us, dammit. Robitussin tasted awful, and salvia triggered horrifying tactile hallucinations, but hey, we had mettle! We were willing to sacrifice in order to be high. That's right, all you young whippersnappers with your kratom and snortable chocolate don't know how good you have it. What's more, the number of newfangled legal drugs seems to be increasing exponentially. Even innocuous products like saunas and headphones are being touted as natural highs. What exactly is going on with our drug culture when many of the newest ways to get high aren't even drugs? I talked to a handful of enterprising psychonauts, a Harvard physician, and an addiction specialist to find out. Are we all just turning into a bunch of drug fiends? Nope. The desire to experience altered states is nothing new. Some people argue it's an intrinsic part of our humanity. "Drugs have always been part of human culture, and in fact, have animal roots (yes, animals get high, too)," says Dr. Jordan Tishler, who practices in emergency medicine and cannabis therapeutics. "The novelty of the 1960s wasn't so much the drugs, but their widespread use and growing acceptance in mainstream life." Spencer Fossier agrees. He's into sensory deprivation -- originating in the 1950s, it's sort of an OG legal high -- and owns a float-tank business in a suburb of New Orleans. "It's human nature -- the same way kids do cartwheels and spin in circles making themselves dizzy just to experience alternate realities, alternate states of mind," he says. Is the search for legal drugs a reaction to American drug policy? The US is not the first country made up of people who like getting high. But its harsh laws for drug sentencing are far from universal. Dr. Howard Wetsman, chief medical officer of Townsend Treatment Centers, says the increasing popularity of legal drugs like kratom is a direct response to the federal crackdown on pill mills. "Kratom has been around for a long time, but it has been increasing in popularity lately because of the government reaction to the opioid epidemic," Dr. Wetsman says. "Is there more demand [for legal drugs] now? Yes, but not because of any essential biological change in humans. What has changed is the potency of the drugs available (leading to greater and faster tolerance) and the social cost and consequences of using them." Basically, take a natural human impulse, incarcerate or stigmatize people who act on it, and you've created two new markets: a prison-industrial complex and a legal drug industry for everyone who wants to avoid it. Come on. Not everyone who's tripping out with a Kasina is an addict, right? Dr. Wetsman points out that a high means different things to different people -- for recreational users, a high is a rush. For addicts -- people whose brains have low midbrain dopamine -- it's just a way to be able to function. Most people won't ever visit the inside of a drug rehab facility, because most people aren't addicts. 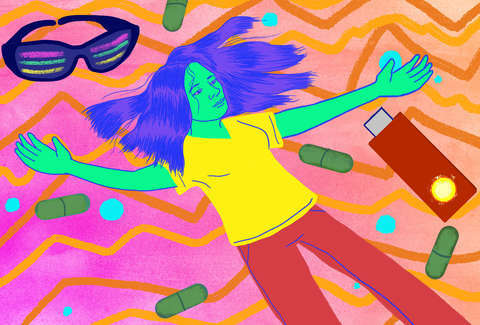 Individuals who partake in legal drugs are often in search of something else: a natural sense of relaxation or a break from the everyday world. For these experiences, a chemical-triggered tidal wave of neurotransmitters isn't always necessary -- chocolate or a soak in salty water can be enough to trigger bliss. "Raw cacao -- a more pure form of chocolate consumed by both mouth and nose -- is the darling of the world's sober-partying culture," says vegan chef Ariane Resnick. "Raw cacao can definitely give you a buzz. The 'high' feeling between regular, alkalized, roasted cocoa powder and raw cacao are distinctly different things." Suzy Lanza, who vapes everything from kava and green tea to CBD, says relaxation is her goal. "Have you ever gotten acupuncture and felt immensely calm afterwards?" asks Lanza, who is launching a new vaporizer. "CBD sort of gets me to those levels, but on an as-needed basis." "Not everybody wants to do mushrooms, where there's a lot of stigma attached," says Fossier, who says he experienced total ego death in a float tank. "People have always liked experimenting with their consciousness, and [legal highs] give people a way of feeling that without the guilt." He emphasizes that he doesn't put himself in a sensory-deprivation environment to trigger a trip-out experience. "It's more of a physical reset for me, like a massage or chiropractor adjustment," he says. Both Dr. Wetsman and legal-high aficionados agreed that in a world that sometimes feels like it's spinning out of control, euphoric experiences can be a way to slow your roll. "In our increasingly demanding world, people crave something to make the noise stop," Dr. Wetsman says. "As long as we continue to focus on the drugs, we'll have people responding by searching for a safe and/or legal drug to use. We need to instead change our paradigm. If you feel there's something not right in your life that a drug would make better, see someone about that." Missy Wilkinson spent 45 minutes in a float tank once, and when she emerged, she realized cars are monsters. Follow her on Instagram @nowlistenmissy.